ACLU is just setting another double standard. If they can kneel for the National Anthem, why can’t this High School honor it’s police force? 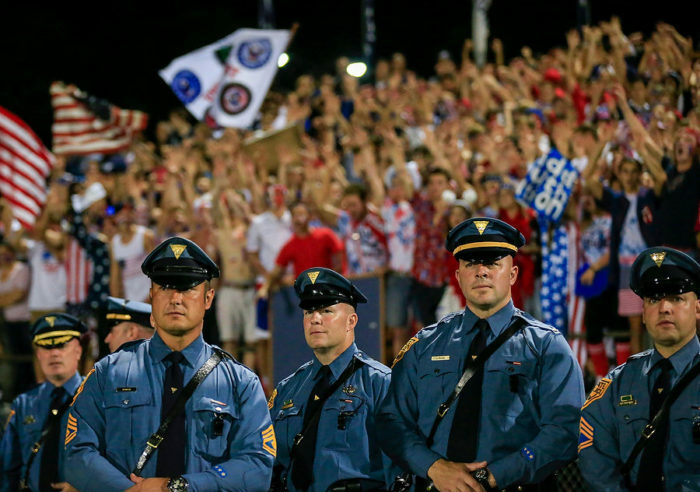 A New Jersey high school has come under fire after holding a ceremony honoring law enforcement, military and first responders before a football game Friday night. Middletown police Deputy Chief Stephen Dollinger organized the event before a highly-anticipated game between Middletown High School South and Toms River High School North. It featured State Police Pipes and Drums of the Blue and Gold, state and local mounted units, personnel from all of the branches of the military and officers from several local offices. The ceremony also honored a Linden police officer who was wounded in a shootout with Ahmad Khan Rahimi, who is accused of planting IEDs in Seaside Park, Elizabeth and New York City. Dolliger also told the Asbury Park Press that the event was meant to respond to pro athletes who have taken a knee during the National Anthem, following the actions of San Francisco 49ers quarterback Colin Kaepernick. Dollinger’s comments to the Asbury Park Press drew scrutiny from the ACLU chapter. The group sent a memo to Middletown High School South officials condemning the event. The letter was also signed by the Central Jersey Chapter of National Organization of Black Law Enforcement Executives and the Greater Long Brach NAACP. “As initially described, the event appeared to honor police officers, veterans, service members, and first responders,” the chapter wrote in the letter.